iDancehallReggae.com::Caribbean Lifestyle Media::: BUZz: JAMBALLAZ RELEASE NEW VIDEO FOR "NO TALK"
BUZz: JAMBALLAZ RELEASE NEW VIDEO FOR "NO TALK"
Jamaican born, New Jersey based rap / reggae trio Jamballaz are once again making their presence felt as recording artists this time with the release of a new video for their anthemic single "No Talk" which has been burning up the underground music scene in the New York tri-state area. The group which consist of members Ice, Joel T and TY all migrated to the U.S in 2005 and has since been working hard to attain credibility in the rap game. Six years later having teamed up with producer Josh Face and created the gritty inspiring hit "No Talk" the dream of making it seems that much closer. In the official video for the track Jamballaz bring their survival and dedication to life by showing a glimpse of how easily their tactics of hustling can be misinterpreted for an even more sinister act. As is the case locally there has long been a stigma surrounding any Jamaican who aspires to become a rapper but Jamballaz simply deletes that notion having captured the attention of hip hop star Jim Jones and DJ Lazy K the acclaimed mixture Queen who have all cosigned for the Ballaz. 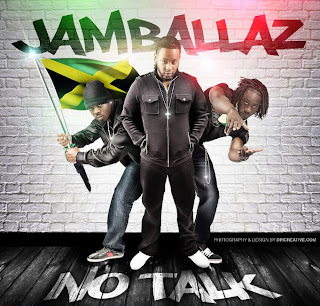 With pockets of success coming in the form of increased visibility thanks to major views on the popular entertainment website worldstarhiphop.com, the Jamballaz are focused on making 2011 a successful year with new fans and business opportunities. Currently managed by Andre "Silence" Dixon of Extreme Chaos Music the trio has plans of releasing a number of other singles ahead of the summer season. Among them will be the Luminato produced "Waist Line" and also "Party On" produced by manager Silence.